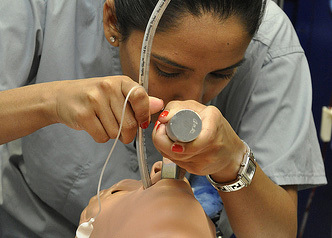 Airway management is an essential skill for anesthesiologists, emergency medical technicians, and other health professionals involved in critical patient care. However, there are a number of physiological complications and unforeseen situations (an unresponsive patient; a morbidly obese patient; a difficult or obstructed airway; vomiting risks; distorted/abnormal anatomy, etc.) that could make successfully performing this crucial procedure problematic for an inadequately trained health worker. Because immediate and decisive life-saving action must be taken at the very first signs of compromised airway function, intense training for procedural proficiency in airway management is crucial. Several research studies support the considerable benefit of using high fidelity patient simulators for airway management training. CAE Healthcare simulators offer a wealth of opportunity for airway management training in high-risk situations -- with no danger to living patients. Unlike real patients, a high-fidelity simulator can be programmed to reproduce different airway complications, patient profiles and multi-faceted pathologies. Learners also benefit from training on state-of-the-art technology with simulators that generate data streams for patient monitoring systems, anesthesia, intensive care, and emergency medicine. From routine intubation to difficult airway management, simulation-based instruction helps learners achieve mastery in clinical procedure, rapid decision-making and effective teamwork. Discover more about CAE Healthcare's Simulated Clinical Experiences (SCEs) in airway management, diagnostic evaluation, advanced life support (ALS) and more, including tools for performance assessment, crew resource management (CRM) and debriefing.